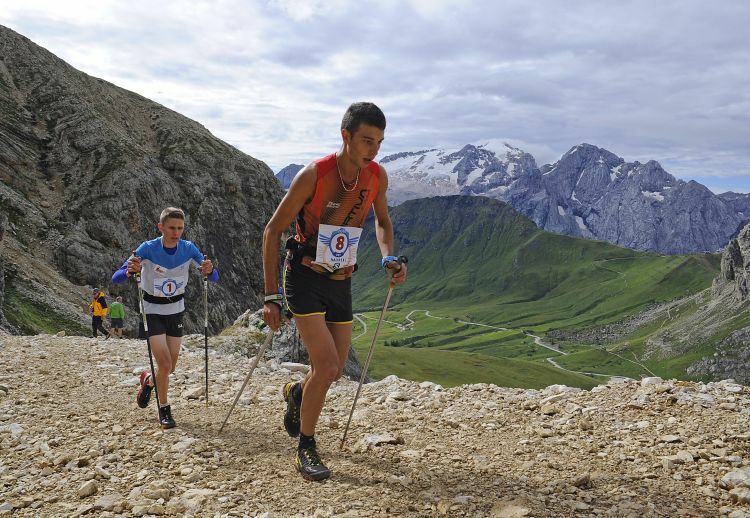 The king of the Dolomites SkyRace does not change. Tadei Pivk, thirty-five years old from Friuli, wins for the second year in a row the prestigious race of Val di Fassa, which is also a leg of the Skyrunner® World Series circuit. Pivk, of Crazy Idea Team took two hours, three minutes and 39 seconds to cover the 22 kilometers of the track, 10 uphill and 12 downhill, with an uphill vertical drop of 1,750 meters. He made the difference in the downhill part, where his technique and his courage allowed him to accumulate two minutes of advantage on its competitors. In the women category, Laura Orgué Vila celebrates two double victories: the number of golds at the Dolomites SkyRace, 2014 and 2016, and the one referring to the three days of Fassa, where Laura won the Vertical Kilometer, showing a great condition. 1.100 participants where present in Piazza Marconi, Canazei, to take off the 19th edition of the race created by Diego Perathoner. As for the men's race, the first to cross the Piz Boe, the highest point of the race with its 3.150 meters, was the Swiss Martin Anthamatten, with 12 seconds on the Norwegian Stian Overgaard and 20 seconds on Tadei Pivk, slightly belated Gonon and Magnini. In the women's category on the same point Laura Orgue transited with two minutes in advance on the Italian Elisa Desco, and two minutes and a half before the French Celia Chiron. However, Pivk attacked on the downhill and increased its advantage, reaching the finish line in 2 hours 3 minutes and 39 seconds, ahead of 2'13" on Overgaard and 2'48" on Anthamatten, both of Team Salomon. Martin Stofner (Sarntal Raiffeisen) just 3'30" behind, Mattia Gianola from Premana (Team Crazy Idea) 3'50", Stefano Gardener (Cornacci) 4'38", Leo Viret 4'38", the Catalan Jan Margarit Sun (Team Salomon) 5'11", David Magnini (Team Salomon) 5'17" and the Frenchman Adrien Michaud (Scott Running) 6'17". In the women's category, Laura Orgue Vila wins the race in two hours 27 minutes and 43 seconds, ahead of 1'56" from Elisa Desco (Scott Running), of 2'10" from Celia Chiron (Optisport), of 4'16" from Maite Maiora (La Sportiva), of 12'14" from the Norwegian Yngvild Kaspersen (Team Salomon), the Catalan Ragna Debats (FEEC), of 13'30" from the Russian Ekaterina Mityaeva (Adidas) and of 17'36" from the Spanish Sheila Avilés Castaño (Matxacuca). © www.sportrentino.it - tools for sports sites - page created 0,078 sec.